There were two men in my childhood who influenced me greatly….my Dad and my Brother Dave. Brother Dave was the energizer bunny. He made me laugh, made me cry, and never emotionally left my side throughout my life. 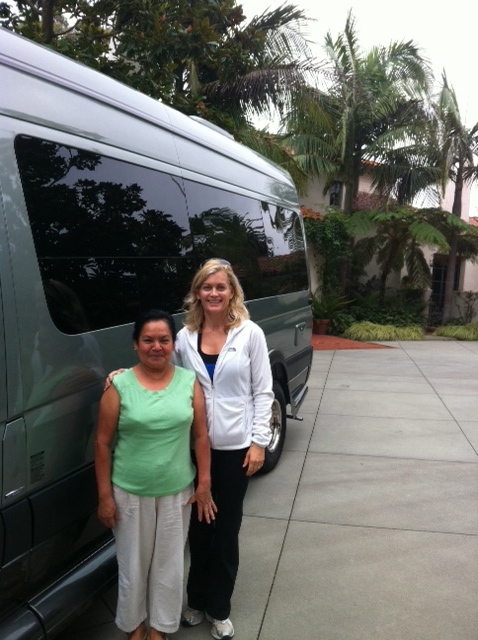 We were only three years apart in age and we had started to help each other with the decisions of our aging families. I am still counting on him to help guide and protect our families as he always did, but he is no longer with me. He died shortly after I turned fifty when he was just fifty-three. No one is ever prepared for the sudden death of a loved one, and this shook my world. I can’t say that he was my best friend because I had those as a child and my husband took that role when I married at age twenty-two. But he was the happy in my childhood. He knew me longer than any other friend I had and I thought he would be with me until I was old enough to say goodbye. 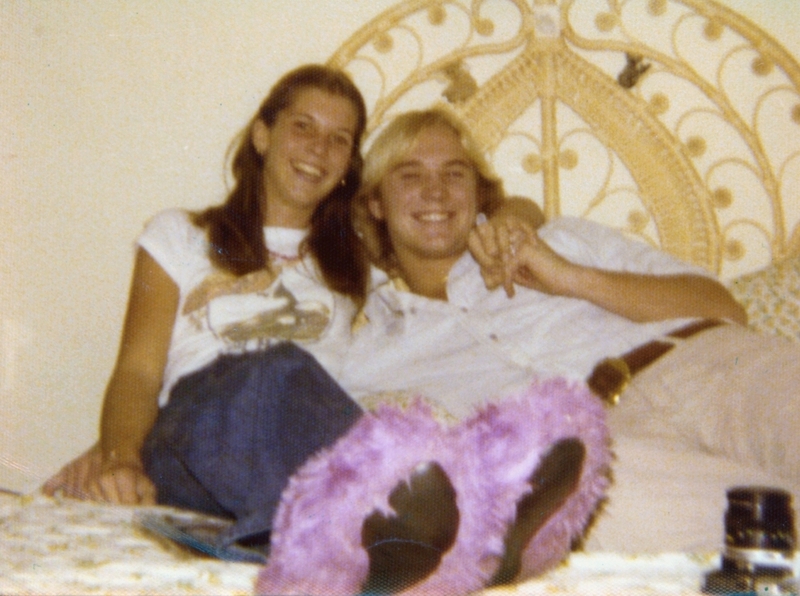 Dave and me as happy teenagers. Love my slippers! My dad was a great dad. He loved me. He taught me. And he let me go. Like my brother, he left before I thought about him leaving. And it hurt more than I could ever imagine. I have great memories of Dad and I am so thankful my children got to meet him. Somehow, it feels better that my kids know who I am talking about when I mention their “Papi”. Dad had grown up on lard and the lard had settled in nicely, clogging up all his arteries at an early age. He had a triple bypass when I was just twenty years old. Years before the surgery, Dad had subscribed to a Pritikin diet and ate daily doses of these homemade mini bran muffins which he aptly named his “bullets”. In high school, and when I would come home to visit from college, I was the designated bullet baker. The bullets were sweetened with apple juice concentrate and contained lots of bran and raisins. He claimed they shot through him like bullets. I grew quite fond of the little bullets and while most people may think they taste a bit rough, it is a familiar taste to me and brings back fond memories of my dad. The bullets may have extended his life a bit, but he still died of a heart attack at age 67 and it broke my heart. Perhaps the bullets would have helped Brother Dave. 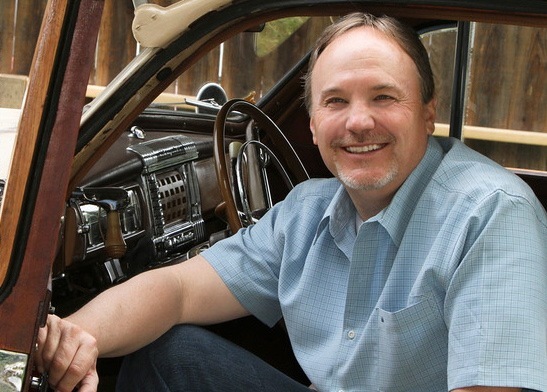 His sudden death left his wife, his children, our family and a whole community reeling. I don’t think I have ever seen Mom so heartbroken, even when her own husband of 40 years passed away. David Alan Flick died of a heart attack at age 53, after living a fairly clean life, with no lard and plenty of margarine. Dave had this photo taken 6 months before he died and in his usual teasing way, told everyone it was his obituary photo. But Brother Dave did love to eat. Mexican food was one of his favorites and he made fast friends with our Mexican housekeeper who is the most trustworthy, loyal and hardworking employee one could ever find. Maria de los Remedios Gama de Martinez (known as Reme) has worked for us now for over 20 years. It hasn’t always been easy, through moves and children and travel, but she is honest and loving and is a member of our family. Brother Dave was a special favorite of Reme. He always asked her to make enchiladas when he came to visit and, during the years we lived close by, Dave would often show up around lunchtime hoping to find some enchiladas in the refrigerator. He would tease Reme saying he thought she made them every day and he was so disappointed there were no enchiladas that day. Sometimes she would surprise him with other treats she had made and, on great occasion, he would find some enchiladas waiting. 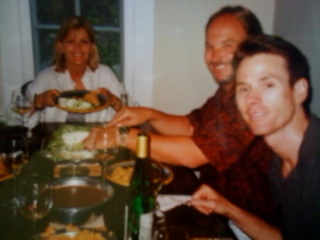 Dave, his wife and his best friend enjoying Reme’s enchiladas at my house in the 1990’s. When Hubby and I decided to move to Santa Barbara, Brother Dave said he needed to learn how to make enchiladas. He had never been a cook, other than pancakes, but Reme was thrilled he wanted to learn. So she meticulously set out to teach him and show him the time-honored method she had been taught by her mother. And he did learn. He wrote it all down and tried it out at his house. They were actually really good when he made them, but they took a long time to make. He eventually decided on some short cuts using canned tomatillos and canned chiles and he was very proud of the results. He made them for many friends, revealing that Reme had taught him her secret special recipe for enchiladas. On the day of his death, Dave stopped by my house to see if there were any enchiladas. He took this photo of Reme and his wife Shari. When Brother Dave died on October 21, 2011, we were all devastated. For his birthday, just two months after he died, I invited a group of his closest friends and family to join together in an enchilada feast in his honor. We were all still in the depths of our loss and relished the occasion to be together and tell stories about Dave. Reme prepared 100 enchiladas that first year, pouring her love for Dave into each and every one. 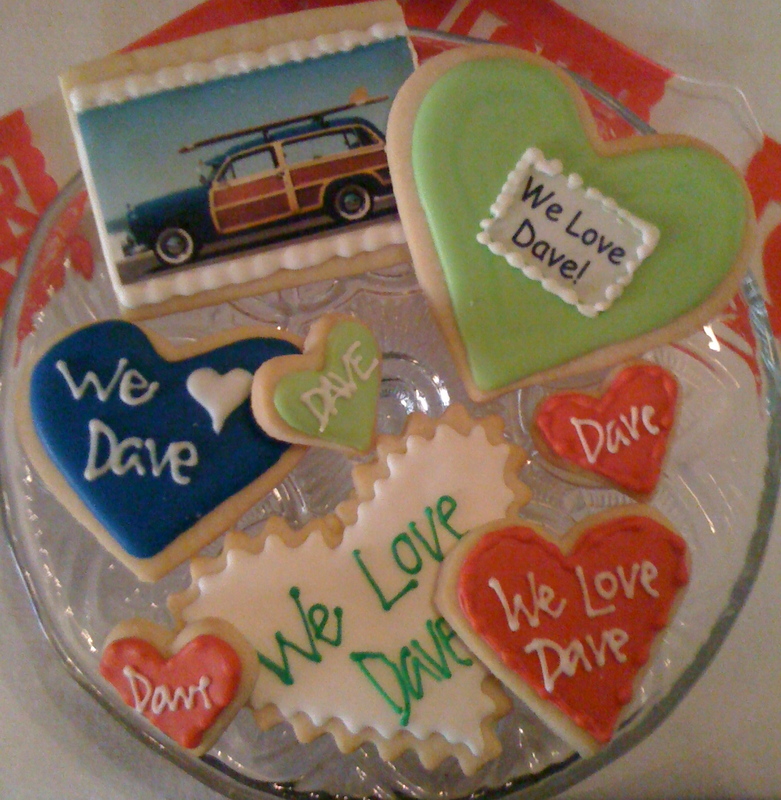 Cookies for DEN by Solvang Bakery. December 27th continues to be celebrated in our family as DEN…Dave’s Enchilada Night. For a truly magical evening, take the time to make these enchiladas with love and celebrate DEN with your family. After the hustle and bustle and commercial hubbabaloo of the holiday season, take a day to cook and eat and embrace your family with stories celebrating life. I promise you won’t regret it. Happy Birthday my beloved brother. I hope there are plenty of Reme’s Enchiladas in heaven. Heat oil on medium heat in large flat pan. Pour salsa into the pan until about 1/2” deep. Fry for 30 seconds then stir until incorporated. Turn heat to low. Using tongs, lay a tortilla into the pan covering it in sauce. After about 15 seconds, flip it over, leave for another 15 seconds, then lift over the pan to drain. Lay at one end of a serving dish, fill with shredded chicken and roll up. Repeat, stacking rolls up against each other until you reach the other end of the serving dish. Spread crema generously over the top of the tortilla rolls. Cover rolls liberally with shredded lettuce, spoon queso cotija down the center, and sprinkle with radishes. Serve immediately with remaining green salsa in a jar to spoon on top. For a spicier topping, re-blend a portion of the salsa with extra chopped chilis. I told myself I would not cry when I saw this post – but I did! Our brother and Dad were wonderful people and thanks to you their memory lives on. Thanks – keep up the good work!! !